Brunch is my new favorite way to entertain. 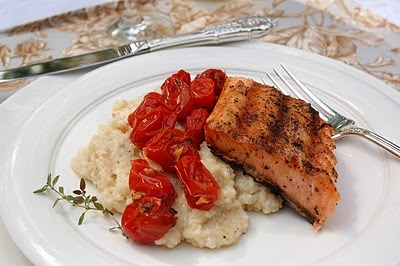 In the past I have hosted big, somewhat lavish brunches — tables full of friends and family, noshes to nibble with a Blood Mary or Brandy Milk Punch before the main event, dessert and coffee afterwards, much fun but a lot of work. My br unches these days are much more relaxed — one guest, fresh fruit and bubbly, a dish which can be mostly be made beforehand, more fruit and bubbly for dessert. 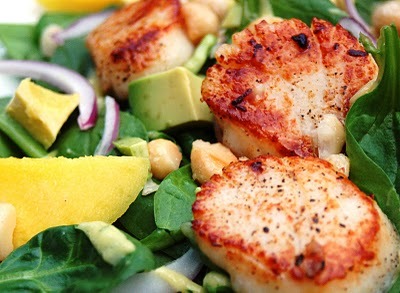 This Spinach Salad with Scallops, Mango, Avocado and Candied Macadamia Nut is perfect. The nuts can be candied and the dressing blended the night before leaving you free to sip champagne and enjoy your guest until just before you are ready to serve. 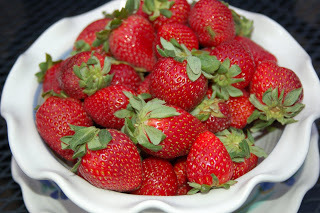 Combine the sugar and tablespoon of water in a saucepan and bring to a boil. Remove the pan from the heat and stir in the macadamia nuts. Toss so that the nuts are thoroughly coated. Spread the nuts onto the baking sheet and sprinkle with the salt. Bake at 350° for 10 minutes, stirring once. Spray a sheet of foil with cooking spray. Remove the nuts from the oven and immediately scrape them onto the sheet of foil. Spread the nuts evenly on the foil. When completely cooled, lightly chop the nuts and set them aside. Combine the the water with the mango, lime juice, olive oil, ginger, and cilantro in a food processor. Blend until smooth. Set dressing aside. Note that this will make more dressing than needed for two servings of salad. Dry the scallops gently but thoroughly between two layers of paper towels. Sprinkle the scallops with the salt and pepper. Heat the olive oil in a medium nonstick skillet over medium-high heat. Add the scallops and sear for about 2 minutes on each side. Be careful not to overcook! Arrange 2 cups spinach on each plate. Top the spinach with half the scallops, 1/3 cup mango, 1/3 cup avocado and 1/8 cup red onion. Drizzle each salad with 3 tablespoons of the dressing and sprinkle with 2 tablespoons chopped nuts.